This is a sort of continuation of the previous post, the one about malware able to infect right-handed only. It’s a Msn malware, one of the recent one (as far as I remember I got it from Malware Domain List). I think there’s often something interesting inside a malware, no matter what it does and this is a perfect example! – why do you need to repeat each block 38 times? – can’t you just use a while statement? – is this a sort of anti-disassembling trick? – can you produce such a procedure setting up some specific compiler’s options? 0040217C    push offset aM4l0x123456789  ; key: "M4L0X123456789"
00402181    call sub_401050              ; decrypt "ntdll.dll"
It’s only a decryption routine, nothing more. The string is decrypted by the “call 401050”, the rest of the code simply moves the string in the right buffer. Ok, let’s try answering the initial questions. 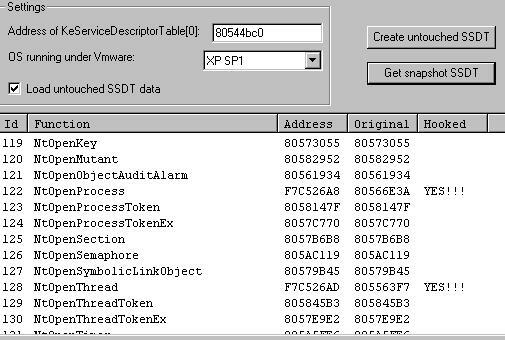 According to some PE scanners the exe file was produced by Microsoft Visual C++ 6.0 SPx. I won’t code something like that, but the macro option seems to be the most probable choice. Is it an anti-disassembling trick? My answer is no because it’s really easy to read such a code. You don’t have to deal with variables used inside a for/while; to understand what’s going on you only have to compare three or four blocks. I don’t have a valid answer to the doubt I had at first…. Trying to find out some more info I studied the rest of the code. I was quite surprised to see another funny diagram. This time the image represents the content of the procedure used to retrieve the address of the API functions. Again, no while/for/do-while statement. The rectangle on the upper part of the image it’s a sequence of calls to GetProcAddress, and the code below it’s just a sequence of checks on the addresses obtained by GetProcAddress. Apart the non-use of a loop there’s something more this time, something that I think reveals an unusual coding style; tha author checks errors at the end of the procedure. I always prefer to check return values as soon as I can, it’s not a rule but it’s something that help you to avoid oversight and potential errors… The procedure has a little bug/oversight at the end, the author forgot to close an opened handle. Just a coincidence? The routine inside the picture contains the code used to check if the API(s) are patched or not. The check is done comparing the first byte with 0xE8 and 0xE9 (call and jump). If the functions are not patched the malware goes on, otherwise it ends. As you can see no loops are used. In summary: it’s not jungle code, it’s not an anti-disasm code and it’s not a specific compiler setting. I think it’s only a personal choice, but I would really like to know why the author used this particular style. Beyond the coding style, the malware has some more strange things. As pointed out by *asaperlo*, the code contains a bugged RC4 implementation (Look at the comments of the previous blog post). This malware spawns another one (it’s encrypted inside the file), it might be material for another post. That’s a funny coded malware for sure! I’m not kidding, the title is right. 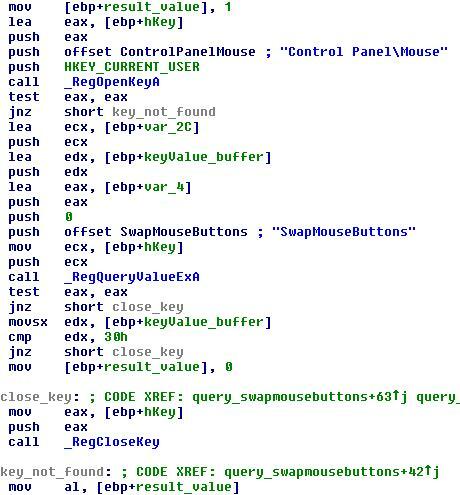 It’s a simple query on a registry key named SwapMouseButtons. result_value is sent back to the caller, and the caller checks the value. If the value is equal to 0x30 (right handed) the malware goes on running the rest of the code, but if the value is 0x31 (left handed) the malware ends immediately. All the nasty things performed by the malware are executed after this check, it means that a left handed won’t get infected! I’ve seen some malwares using SwapMouseButton function in the past, but never something like that. I bet the author is left handed and he wrote the check just to be sure to avoid a possible infection… I can’t think of anything else. Quite funny!! !